The bad, the ugly and the deadly. Some of the world’s most infamous viruses, parasites and bacteria emerged from under the microscope to take center stage at the 3rd annual International Conference on Tropical Medicine. The event was hosted by the Herbert Wertheim College of Medicine (HWCOM) Department of Molecular Microbiology and Infectious Diseases Feb. 21 and 22. This year’s conference, co-sponsored by the Americas Health Foundation, attracted experts from around the word to discuss breakthroughs and paradigm-altering science and technology in emerging and tropical diseases. Tropical diseases are a major problem principally between the Tropic of Cancer and the Tropic of Capricorn, but increased travel and migration has made their reach widespread. Approximately 15 million people die each year due to tropical infectious and parasitic diseases. “This conference provides a forum that supports interdisciplinary professional and academic development, and first-hand access to state-of-the-art advances in the science and practice of tropical medicine and emerging infections to all participants, “ said Dr. Aileen Marty, organizing co-chair of the conference and clinical professor in the department of molecular microbiology and infectious diseases. Other notable speakers included international faculty and staff from prestigious institutions including the Venezuelan Institute for Scientific Research; the United States Southern Command; the National Institutes of Health; the Centers for Disease Control and Prevention; the Southern Research Institute; the University of West Indies, Jamaica; the School of Tropical Medicine, Kolkata, India; Harvard Medical School; Optum Health; and FIU. 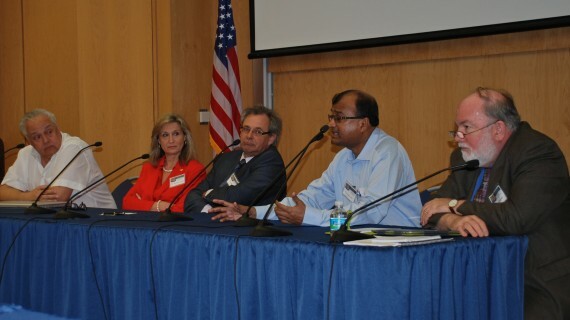 HWCOM professors Kalai Mathee, Rita Mukhopadhyay, and Marty served as moderators. Infectious disease specialist Dr. Jorge Murillo presented an interesting overview on tropical diseases in South Florida making a convincing case for the need to create in South Florida a center for the diagnosis and treatment of tropical diseases. Murillo, an associate professor at the HWCOM and a partner at the South Florida Infectious Disease & Tropical Medicine Center, noted recent data shows reported cases in South Florida of diseases like malaria, dengue, typhoid, hepatitis E, Chagas, and leprosy, which are typically associated with faraway exotic places. One of the challenges this presents is that primary care doctors are often unfamiliar with the symptoms of many of these tropical diseases. “It is imperative to create a center for the diagnosis and treatment of Tropical Disease and to establish educational programs to familiarize health care providers and diagnostic laboratories with these clinical entities,” said Murillo. This sentiment was echoed by Andrus in his lecture on “Neglected Tropical Diseases (NTDs) in the Southern United States.” NTDs are usually thought of as a group of chronic parasitic and related infections occurring among the “bottom billion” living in the poorest developing countries, but they are increasingly striking wealthy countries like the United States, Australia and European nations. HWCOM is currently in the process of establishing an Advanced Center for Innovative Solutions for Tropical and Emerging Infectious Diseases (FIU-ACISTED) under the auspices of the molecular microbiology and infectious diseases department headed by Mathee. “We are not only ideally situated as a gateway to and from the subtropical and tropical regions south of our border, but we recognize the need to provide indications and warnings of the changing threats from tropical and emerging infections, and we must share our data and pool our talents in order to make a difference,” Mathee said.